King County is about to count its homeless population. They will probably get it wrong. Early Friday, hundreds of volunteers will fan out across King County streets, forests, parks and well-hidden places to determine how many people are experiencing homelessness here. Even if the count goes according to plan, the answer to that question will remain the same: No one really knows for sure. That’s partly because the point-in-time count, known as Count Us In, is just that: a snapshot of homelessness on a given night. While 11,643 homeless people were counted in the January 2017 snapshot, the actual number of people who were homeless in 2016 was 29,462, according to King County’s Homeless Management Information System, a database of people who requested homelessness services. The one-night numbers reflect who was homeless on a single night, versus the cumulative number of people who experienced homelessness in one year. Officials, however, say the point-in-time count is useful, and King County has refined its approach over the past two years to get a clear snapshot of where people are experiencing homelessness and why. Whether the count goes up or down could prove to be a watershed moment for Seattle and King County, which are spending a record amount on the crisis. Seattle alone will spend $63 million on homeless services in 2018, in addition to a huge, new affordable-housing levy, passed two years ago. The leaders of the city and county say they have improved their strategies to reduce homelessness, overhauling the types of services they fund. That could make the results of this year’s one-night count particularly important: Are the strategies working? The U.S. Department of Housing and Urban Development requires that communities across the country do a count at least once every two years if they are to be eligible to receive federal funding, making this the best year-over-year comparison among cities available. 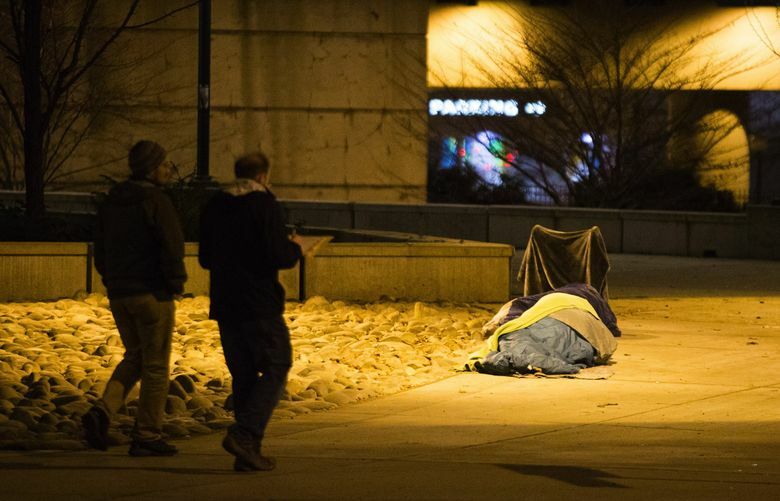 “This is really just meant to be observational, our best understanding of the scope of how many people are outdoors on any given night in the county,” said Kira Zylstra, assistant director of All Home, King County’s homeless-services coordinating agency. The street count will take place, rain or shine, from about 2 a.m. to 6 a.m. Friday. Final results won’t be released until late May or early June. The event involves three parts: a physical count of people living outside; a count of people living in homeless shelters; and a follow-up survey of homeless individuals. Special efforts are made to count people in sanctioned and unsanctioned homeless camps and people who ride buses overnight. This is the second year King County has done what it hopes is a more comprehensive street count, with volunteers scouring all 398 King County census tracts. Rather than using local activists to run the count, as it had done for years, the county hired Applied Survey Research (ASR), a Bay Area social-sciences firm that has done numerous homeless counts and surveys, mostly in California, including San Francisco. The new count is more methodical, said ASR Vice President Peter Connery, utilizing the census tracts and the follow-up survey. Unlike counts previously run by the local nonprofit, the new methodology includes homeless youngsters and young adults. This year, the youth count will take place Thursday, the day before the larger, general count. Also new last year, and continuing in 2018, the county will pay guides who are currently or previously homeless to lead teams of volunteer counters. Guides have a level of street smarts that volunteers won’t have, Connery said. They will know specific locations and often can distinguish between a safe situation and a dicey one. “You gotta be careful where you go,” said Daniel Long, 37, who will be a guide for the first time this year. Guides can make up to $75 for attending a precount training session and for the hours they work on the morning of the count. 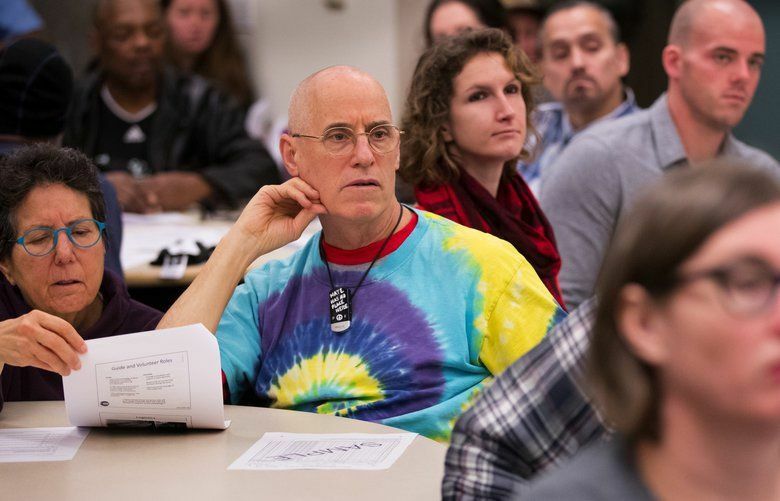 Volunteers visually count homeless people — they do not engage with them or ask them questions. They are trained to estimate someone’s age and to note where someone is when they see them. Volunteers mark everything on tally sheets, so everyone records observations the same way. If possible, volunteers are asked to note the last four digits of a license-plate number, if someone is living in a vehicle. Be respectful of people’s space, Connery advised at a recent training session in downtown Seattle for volunteers and guides. Flashlights are for lighting the ground, not shining into someone’s tent or vehicle. There may not be a person experiencing homelessness in all 398 census tracts, but officials “don’t want to make too many assumptions,” Connery said. He noted that the city regularly removes homeless camps, which can result in people living in areas they normally wouldn’t. Two to three weeks after the point-in-time count, volunteers follow up with a survey of homeless people, a sampling of the overall population. Last year, 1,100 surveys were administered, Zylstra said. The purpose is twofold, she said. Officials get a better sense of trends (how long people have been homeless, where they were living when they became homeless, how many of the homeless are veterans, and so on). They also use the survey to estimate the number of people living in tents, vehicles and abandoned buildings. The survey almost works like a poll from which officials can derive broader conclusions — using the average number of people sharing those spaces based on the survey, and extrapolating based on the tents, vehicles and such noted the night of the count. It is a more sophisticated approach than one used previously, when counts assumed two people per tent and vehicle, without knowing the number of people inside. For all the care taken, the count is not an exact science. It does not include people “doubling up” with other family members or couch surfing with friends. It does not include homeless people in prison with nowhere else to go after release. In short, the one-night count is sophisticated, educated guesswork. One study in New York City suggested about one-third of people living outside were missed in the count. Others have found a much higher undercount. Connery acknowledges there is a varying level of accuracy depending on the counting methods in each community. A homeless count can be a politically charged issue, and many cities may not want a high count because of the implications in the mind of the public, he said. But, Connery said, King County in his experience has been unafraid to face the reality of its large homeless population, the third-largest in the country last year. “The smart communities, and I think King County is one of those, are really open to data collection and are really committed to transparency and accurate data and using it in programming and strategic thinking about how to end homelessness,” Connery said.